Using voice commands has become pretty ubiquitous nowadays, as more mobile phone users use voice assistants such as Siri and Cortana, and as devices such as Amazon Echo and Google Home have been invading our living rooms. These systems are built with speech recognition software that allows their users to issue voice commands. Now, our web browsers will become familiar with to Web Speech API, which allows users to integrate voice data in web apps. With the current state of web apps, we can rely on various UI elements to interact with users. With the Web Speech API, we can develop rich web applications with natural user interactions and minimal visual interface, using voice commands. This enables countless use cases for richer web applications. Moreover, the API can make web apps accessible, helping people with physical or cognitive disabilities or injuries. The future web will be more conversational and accessible! In this tutorial, we will use the API to create an artificial intelligence (AI) voice chat interface in the browser. The app will listen to the user’s voice and reply with a synthetic voice. Because the Web Speech API is still experimental, the app works only in supported browsers. The features used for this article, both speech recognition and speech synthesis, are currently only in the Chromium-based browsers, including Chrome 25+ and Opera 27+, while Firefox, Edge and Safari support only speech synthesis at the moment. This video shows the demo in Chrome, and this is what we are going to build in this tutorial! Use the Web Speech API’s SpeechRecognition interface to listen to the user’s voice. Send the user’s message to a commercial natural-language-processing API as a text string. Once API.AI returns the response text back, use the SpeechSynthesis interface to give it a synthetic voice. The entire source code used for this tutorial is on GitHub. Make sure Node.js is installed on your machine, and then we’ll get started! The -f accepts the default setting, or else you can configure the app manually without the flag. Also, this will generate a package.json file that contains the basic info for your app. With the --save flag added, your package.json file will be automatically updated with the dependencies. We are going to use Express, a Node.js web application server framework, to run the server locally. 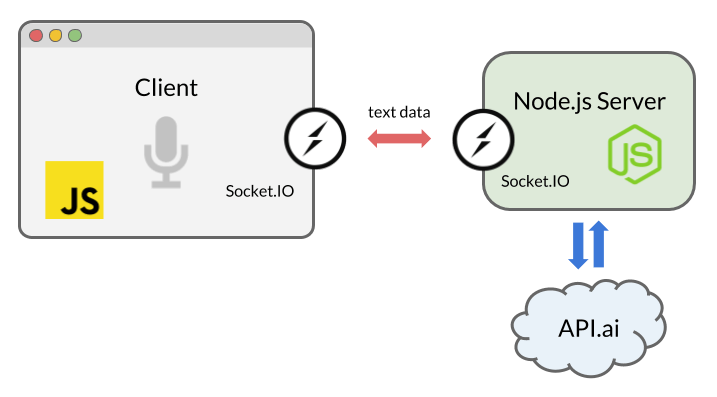 To enable real-time bidirectional communication between the server and the browser, we’ll use Socket.IO. Also, we’ll install the natural language processing service tool, API.AI in order to build an AI chatbot that can have an artificial conversation. Socket.IO is a library that enables us to use WebSocket easily with Node.js. By establishing a socket connection between the client and server, our chat messages will be passed back and forth between the browser and our server, as soon as text data is returned by the Web Speech API (the voice message) or by API.AI API (the “AI” message). Now, let’s work on our app! In the next step, we will integrate the front-end code with the Web Speech API. The Web Speech API has a main controller interface, named SpeechRecognition, to receive the user’s speech from a microphone and understand what they’re saying. To style the button as seen in the demo, refer to the style.css file in the source code. We’re including both prefixed and non-prefixed objects, because Chrome currently supports the API with prefixed properties. Also, we are using some of ECMAScript6 syntax in this tutorial, because the syntax, including the const and arrow functions, are available in browsers that support both Speech API interfaces, SpeechRecognition and SpeechSynthesis. This will return a SpeechRecognitionResultList object containing the result, and you can retrieve the text in the array. Also, as you can see in the code sample, this will return confidence for the transcription, too. Now, let’s use Socket.IO to pass the result to our server code. Socket.IO is a library for real-time web applications. It enables real-time bidirectional communication between web clients and servers. We are going to use it to pass the result from the browser to the Node.js code, and then pass the response back to the browser. You may be wondering why are we not using simple HTTP or AJAX instead. You could send data to the server via POST. However, we are using WebSocket via Socket.IO because sockets are the best solution for bidirectional communication, especially when pushing an event from the server to the browser. With a continuous socket connection, we won’t need to reload the browser or keep sending an AJAX request at a frequent interval. Now, let’s go back to the Node.js code to receive this text and use AI to reply to the user. Numerous platforms and services enable you to integrate an app with an AI system using speech-to-text and natural language processing, including IBM’s Watson, Microsoft’s LUIS and Wit.ai. To build a quick conversational interface, we will use API.AI, because it provides a free developer account and allows us to set up a small-talk system quickly using its web interface and Node.js library. Once you’ve created an account, create an “agent.” Refer to the “Getting Started” guide, step one. Then, instead of going the full customization route by creating entities and intents, first, simply click the “Small Talk” preset from the left menu, then, secondly, toggle the switch to enable the service. 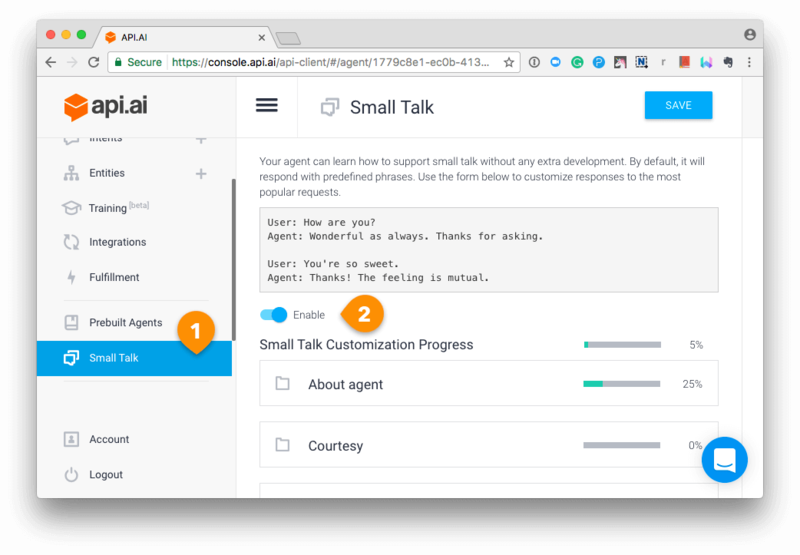 Customize your small-talk agent as you’d like using the API.AI interface. Go to the “General Settings” page by clicking the cog icon next to your agent’s name in the menu, and get your API key. You will need the “client access token” to use the Node.js SDK. If you just want to run the code locally, you can hardcode your API key here. There are multiple ways to set your environment variables, but I usually set an .env file to include the variables. In the source code on GitHub, I’ve hidden my own credentials by including the file with .gitignore, but you can look at the .env-test file to see how it is set. Now we are using the server-side Socket.IO to receive the result from the browser. socket.emit('bot reply', aiText); // Send the result back to the browser! When API.AI returns the result, use Socket.IO’s socket.emit() to send it back to the browser. Let’s go back to script.js once again to finish off the app! Create a function to generate a synthetic voice. This time, we are using the SpeechSynthesis controller interface of the Web Speech API. In the function, first, create a reference to the API entry point, window.speechSynthesis. You might notice that there is no prefixed property this time: This API is more widely supported than SpeechRecognition, and all browsers that support it have already dropped the prefix for SpeechSysthesis. Then, create a new SpeechSynthesisUtterance() instance using its constructor, and set the text that will be synthesised when the utterance is spoken. You can set other properties, such as voice to choose the type of the voices that the browser and operating system should support. Finally, use the SpeechSynthesis.speak() to let it speak! Now, get the response from the server using Socket.IO again. Once the message is received, call the function. You are done! Let’s try a chit-chat with our AI bot! Note that the browser will ask you for permission to use the microphone the first time. Like other web APIs, such as the Geolocation API and the Notification API, the browser will never access your sensitive information unless you grant it, so your voice will not be secretly recorded without your knowledge. You will soon get bored with the conversation because the AI is too simple. However, API.AI is configurable and trainable. Read the API.AI documentation to make it smarter. I hope you’ve enjoyed the tutorial and created a fun chatbot! Push The Web To The Future! Voice interaction has transformed the way users control computing and connected devices. Now with the Web Speech API, the user experience is transforming on the web, too. Combined with AI and deep learning, your web apps will become more intelligent and provide better experiences for users! Finally, check out the different natural-language-processing tools and conversational platforms!